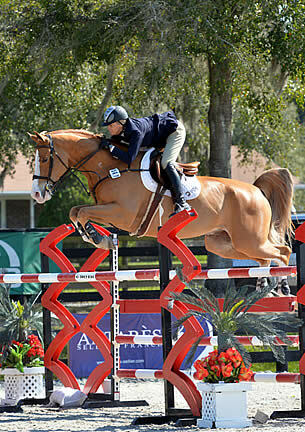 OCALA, FL (January 24, 2013) – Tracy Fenney admits to having big plans for 2013, not the least of which include the Pfizer $1 Million Grand Prix. She and MTM Farm’s MTM Timon got those plans underway today with a win in the $25,000 SmartPak Grand Prix, presented by Pfizer Animal Health, during Week II at HITS Ocala. Fenney and her 13-year-old Dutch Warmblood gelding bested eight in the jump-off after a field of 30 rode a 13-obstacle course designed by Ken Krome of Westminster, Maryland. “I thought the course was certainly fair for $25,000, but was not without a few challenges,” said Fenney. The track included three double combinations – a vertical to an oxer at five, an oxer to a vertical at nine and the final vertical to vertical at 12. It was the last combination – a tight one stride – that dished out the most trouble, according to Fenney. Of the eight who advanced to the jump-off, five where clear and it was Jared Petersen of Arch, Florida who set an early Great American Time to Beat with a clear round in 38.30 seconds. He piloted Derek Petersen’s Titus 2:11. Fenney was second to ride and was more than ready to wage a battle of speed for the win. Known for their talent of riding against the clock, she and MTM Timon went clear in 37.49 seconds and would not be caught. “I saw the super tight turns that [Jared] Petersen made and knew that we were just going to have to chase him down and hope that everyone behind us would make some mistakes,” said Fenney. James Gillam of North Hatley, Quebec was third in the jump-off and was able to produce a clear round with Maggie Webster’s Channol to sit third with a time of 41.99 seconds. He would drop two spots, however, to finish in fifth. Callan Solem and Horseshow Trail Farm’s VDL Wizard went clear in 40.31 seconds to steal third, but were bumped to fourth by Jenna Friedman of Alpharetta, Georgia in the irons of her own Zidoctro. Fenney has seen success in surplus in grand prix at HITS Ocala in the past several years and has her two top mounts, MTM Timon and MTM Centano ready for another successful season while she and husband Mike McCormick also have 30 horses total on the show grounds this season. HITS Ocala will offer the $50,000 HITS Grand Prix, presented by Pfizer Animal Health on Sunday and continues to feature two weekly grand prix as momentum builds for the $100,000 Sullivan GMC Truck Grand Prix, presented by Great American Insurance, during Week VII to close out the 2013 HITS Ocala Winter Circuit on a high note. 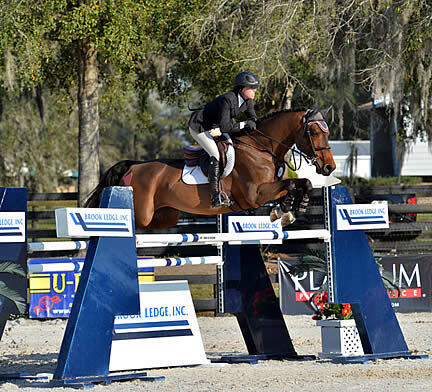 Lisa Goldman of Hawthorn Woods, Illinois and Mary Goldman’s Centurion B got things started during Week II of competition at HITS Ocala with a blue ribbon in the weekly $2,500 Brook Ledge Open Welcome. Brook Ledge Horse Transportation will present an Open Welcome class every week, and will host many familiar faces as riders use the popular offering as preparation for the big-money grand prix each week. The rider who accumulates the most points in the Brook Ledge Open Welcome classes throughout the circuit will be presented with the Brook Ledge Rider Bonus, which includes a $1,500 shipping credit. Goldman made two appearances in the top-five as she also piloted her own Morocco to fourth. Goldman and Morocco finished sixth in today’s grand prix. Jonathon Millar of Perth, Ontario was second with Millar Brook Farm, Ltd’s Calvin Klein and Randi Goble of Friendsville, Tennessee was third aboard his own Platinum. Rounding out the top five was Columbia’s Santiago Medina of Waterford, Virginia and his own Monterrey.